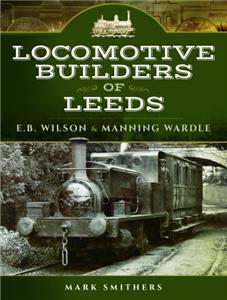 The history of commercial railway locomotive manufacture in the Leeds is a fascinating story, covering a period of nearly two centuries, which commenced during the Napoleonic period and only came to an end in 1995. The two companies that most epitomised the formative years and period of consolidation of this this part of Britains industrial history were E.B. Wilson & Co (1846-59) and Manning Wardle & Co (1858-1927). The former manufacturer was well known for the Jenny Lind locomotives and their derivative designs used on several British main lines during the mid-nineteenth century. They proved to have a profound influence upon the work of other manufacturers for main line needs. The latter company was a builder of contractors and industrial locomotives, used worldwide, whose mainstream designs were likewise highly influential upon the work of neighbouring manufacturers, constituting a sphere of locomotive production that lasted from before the Crimean War until after the end of the Second World War. In this new work, Mark Smithers draws upon a variety of sources, both documentary and illustrative, to arrive at an up-to date appraisal of the achievements of these companies during their respective periods of production, and their legacy to the greater sphere of British railway locomotive development.